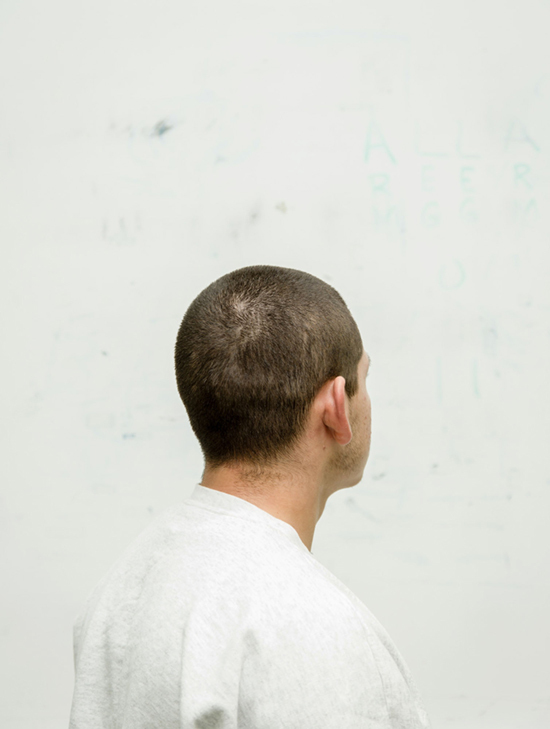 — Life plus 30 years is the sentence for this boy at Barry J. Nidorf Juvenile Hall in Sylmar, California. I took his picture while working for The California Sunday Magazine a few years ago. Although I have portraits that show his face the magazine was afraid to publish them because they did not have parental consent. At 16, he was considered old enough to be tried as an adult for murder but not old enough to give permission to have his picture taken. Stefan Ruiz was born in 1966, in San Francisco. He studied painting and sculpture at the University of California, Santa Cruz, and the Accademia di Belle Arti, Venice, before turning to photography. He has taught art at San Quentin State Prison and was the creative director for Colors magazine from 2003 to 2004. His work has appeared in magazines including the New York Times Magazine, Details, L’Uomo Vogue and Rolling Stone. His photographs have been exhibited at the Photographers’ Gallery, London; Photo España, Madrid; Les Rencontres d’Arles, France; New York Photo Festival; Havana Biennial; and the Contact Photography Festival, Toronto. In 2012, Aperture published his monograph, The Factory of Dreams, a book on Mexican soap operas.